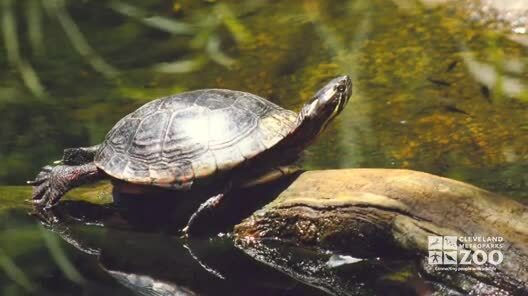 Malaysian Giant Pond Turtles can grow to 28 to 32 inches. Carapace is low, smooth, oval and uniformly dark gray, brown or black. The pale buff colored plastron is long and narrow and the side margins may be keeled. The head is relatively large and broad. The snout with a slightly hooked upper jaw projects a bit. Large scales run in a strip between the tympanum and eye and there are granular scales on the back of the uniformly brown-black head. Forelegs also have scales on the front. Toes are webbed. Males tails are longer and thicker then females. The young have a white line extending from the corner of the mouth down the neck. With age the develop white random, spider-web-like markings on the central scutes. The range of the Malaysian Giant Pond Turtle is the Malay Peninsula, Sumatra and Borneo. Malaysian Giant Pond Turtles are found in and near large bodies of fresh or possibly slightly brackish water. 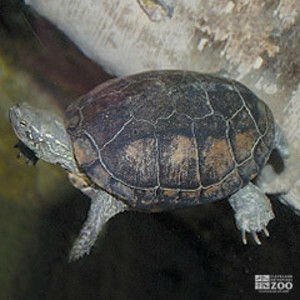 Malaysian Giant Pond Turtles spend much time basking in the sun near the waters edge and eat in both water and on land. This Malaysian Giant Pond Turtle nests in piles of debris. Eggs are brittle and ellipsoidal, about 80 x 40 mm. Hatchlings are about 60mm long with very rugose carapaces and sharply serrated posterior marginals.